WordPress is so popular that nearly 23.3% of websites of the world are using it. Used by more than 10 million websites, this CMS with plug-in structures and template system offers an edge to content management. Whether you want a large shopping portal or just a small blog, WordPress is the primary choice for you. Optimal Virtual Employee provides professional WordPress web developers, who are savvy with the most recent versions of WordPress, and equipped for building a dynamic website with custom features. Our WordPress programmers are empowered to complete complex projects flawlessly. The majority of our WordPress developers and programmers are engaged in accomplishing excellence while handling each and every assignment within the stipulated timeframe. Our work process dependably stays smooth and we guarantee our customers successful completion of their tasks with quality. Our experienced developers are efficient enough to make perfect use of vast features and advantages of WordPress. Our custom service can help you get a new WordPress website created based on your custom requirement. Even if you choose a certain theme for the website we can get you any type of changes in the website based on your custom needs. As you know plugins provide you any type of functionality on your WordPress website. Many times website owners do not want to use a free or paid plug-in available in the market for getting any new functionality. In that place he wants to get a custom plug-in built to meet his needs. Our service will include any type of requirement from your side. 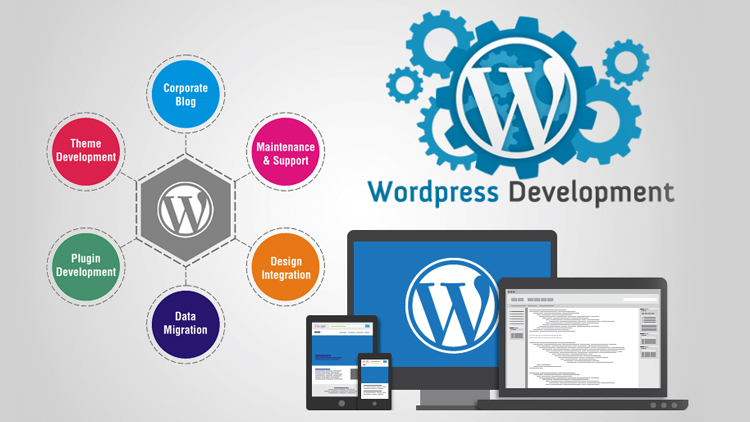 Our WordPress developer can easily create any type of development to get any type of functionality you are looking for. Sometimes website owners want their websites to move to a WordPress platform as they feel that their existing website is not good enough. Our dedicated workers can also help in this by getting a smooth migration of your website to WordPress platform. Whether your website is on Opencart, on Magento or just on a custom PHP platform you can be sure that your website will be smoothly migrated to WordPress platform. Sometimes business owner do not like the themes available in the market. They want to create a custom theme suiting their requirement. Our WordPress developer can do the job easily for you in that case. The themes can be designed according to need of your business. Whether you need just another corporate website or a classified website or a shopping website they we can deliver the same. If you go for WordPress you will realize that it has blog functionality by default. You can use it for maintaining any blog section required for your need. Our developers can create any kind of changes required by you in terms of design or finality on your demand. Our WordPress developers do the job of website maintenance for you. If you need any type of support you can go for them. The support will include all kinds of work needs whether you need any dramatic change in the design or functionality or just making sure there is no issue in terms of web presence. Our developers will provide you all kinds of maintenance for you. Why Hire From Optimal Virtual Employee? Organizations hire a WordPress developer from Optimal Virtual Employee because they get the best solutions for their problems using the recent technology used by WordPress. Our WordPress developer examines each aspect of the new technology before practicing it. Our applications include advanced features taking into account complex business requirements for different industry verticals. We mix the mastery of our devoted WordPress developers with imaginative technology and offer solutions that are delivered on time. Hire WordPress designers on hourly or full time (committed month to month) basis who have a record of delivering WordPress projects of all sizes and across industries with 100% customer client satisfaction. Our virtual employees can also provide you with the all kind of custom development on the WordPress platform. Whether you are looking for just a corporate website or a full scale e-commerce platform you can get all development work done by our staff. If you are looking for addition of any functionality it will be done by us too. Whether you want to add a small form on the website for generating leads or a functionality to send automated emails to users, we will be handling it well. If you want to launch your website in a certain vertical like real estate, or just an informational website or a news portal or a web portal using advanced technology like block chain technology, AI or AR, our team of developers is capable of handling them all. Unlike paid CMS, WordPress is totally free. You can develop and get your website up and running within few hours without any development cost. This is very useful for small business owners who are looking for a cost effective way to go online. It is built on PHP programming language and thus can support custom requirement of your website. WordPress started a blogging platform. It was created as a free platform for people who wanted to start a blog without any cost. However, over a period of time it has become too robust and feature laden to be used by even big website owners. Now everyone, from a real estate classifieds to ecommerce players, is using WordPress as this CMS has features for needs of everyone. What is great about WordPress is that it is flexible and scalable. You can create any website of any scale with this platform. Even if you have millions of products on your ecommerce website or have millions of visitors per day on portal WordPress will support your website without a glitch. Since the platform is built on PHP platform it is totally scalable. WordPress is created with a goal to let anyone create their website with any requirement for learning programming. Most websites are designed by professional designers and developed by professional developers, who are known for their programming knowledge. On the other hand, WordPress is created with the sole aim to make sure anyone can create their own website without any help of a professional developer. All you need is a domain name and hosting and you are all set to launch your own website. It’s very easy to install and setup. It can be setup in 5 minutes. Within few minutes your website will be up and running. Then you can go to admin panel and start writing articles or posts on the website. If you require any additional feature just install any of the plug-ins and you are ready to do business. Creating a new design or changing design of an existing website is not easy. You normally need help of a professional designer to do that. However, if your website is on WordPress CMS, then you can easily change the entire website design after just changing the theme of the website. Changing the website theme is easy. There are thousands of free themes available which can be used to give your website any type of professional looking design. Whether you have an ecommerce website or a corporate website or a real estate website you will find themes suiting your requirement for free. All you need to do is to do a Google search. If you do not have your website on WordPress then you may have to spent thousands of dollars and months of time to get a new look for the feel of your website. Needless to say that using WordPress CMS saves both money and time for your business. If you have a website and want to add a new feature, then what would you do? If you have a normal website then you would need help of a developer and designer to get the additional features on the website. However, on WordPress it will take just few minutes to have a new feature or functionally on the website. All you will have to do is install and new plug-in. WordPress website lists thousands of plug-ins for almost all kinds of requirements for free. Whether you need a form for contacting you or newsletter feature for gathering emails of visitors or emails to be sent to users or a new popup on the website you can get all these functionality by just installing plug-ins. For example, you want to start an e-commerce portal then all you need to do is install an e-commerce plug-ins like WooCommerce and you are ready to sell products online. Depending on your requirement you can install or uninstall any plug-in any time you wish. WordPress websites are more SEO friendly. This is because WordPress has many plug-ins that add SEO friendly features on your website like SEO friendly URL and meta tags. WordPress also pings search engines once there is any update on the content of the website. This works in favor of this CMS platform. WordPress websites are mobile friendly. Even though all themes are not mobile friendly most of them are. If your website theme is not mobile responsive then you can simply change the theme or get a plug-in which makes your website responsive to all kind of screens. Being mobile friendly is one of the key features of being SEO friendly. Even if your website is a corporate website or an e-commerce website you may require a blog section for regular updation of fresh content for your users. If you have a normal website then you will have to develop and design a new section for blog postings. However, if your website is on WordPress CMS then you will have to do nothing as a blog section is given by default on WordPress. You can simply start posting articles on your Blog section after making it visible for your website users. The blog section has all kinds of features like adding, editing and removing blog posts. A great thing about WordPress is that it has a thriving community of WordPress developers, who support the platform in various ways. Many of the voluntarily develop a new version of the platform, and some create free plug-ins for the CMS. If you are stuck with some kind of issue in your website do not know how to resolve that then simply got to WordPress community forms and you will get resolution of your query by any volunteer. This kind of free support is valuable. All of the above features make WordPress the most popular CMS which is used by all kinds of website owners whether they are looking to just have a good corporate website or a large e-commerce platform to generate millions of dollars of sales. With countless development projects added to our repertoire, we look forward to serving you the most ideal way. If you hire WordPress developer from Optimal Virtual Employee then you will get the following benefits. If you hire WordPress developer then he will try to understand your requirement first. And then we come up with a solution. This helps us create a full-fledged strategy for the work requirement of the client, which will help the client in getting the work of their requirement. We have highly skilled employees who are well versed in their domains. These are professionals with many years of experience and can handle all of kinds of project or work as per your need. They have good communication skill and can handle work of all complexity levels. Since they are dedicatedly working for your company, you will get the best desired output from them. No need to say that our WordPress developers are well versed with latest technical trends. They are at the cutting edge of the technical advancement. They have worked on most complex kind of projects in the past and can develop any project of your requirement even if it’s very complex one. Whether you are looking for creating an e-commerce project or a high tech mobile app, our virtual employees are capable of developing them. Our remote workers have worked on the latest technology in the IT industry, whether it is AR (augmented reality), blockchain technology or AI (artificial intelligence). Having worked on various websites and applications, our team has experience of multiple projects and verticals. If you hire WordPress developer from us then you will realize that they are well versed with all kind of open source platforms like WordPress, Joomla and Magento. They have the capability to handle any complex development on any open source platform. They can modify any kind of change in your existing open source platform or CMS (content management system). If you want a new website in a popular CMS named WordPress, our virtual employee can do it for you easily. They can install the WordPress, customize it and then can make it work as per your need. If you want any kind of new design or theme of your WordPress website that will also done without any issue. If you have a new website on WordPress or you want to make custom changes in your existing WordPress websites, our developers can easily make all kind of development work on that. Any type of custom work can be done on WordPress website of yours. Many times some clients look for a custom development requirement as they are not looking for a free plug-in for their word press website. Even in that case we can get it done easily. If you hire WordPress developer from Optimal Virtual Employee then you will end up saving 70% of your cost. This will help the bottom-line of your company. One of the main goals of any company is to increase profit by reducing cost on a regular basis. Hiring our staff will help in that cause. The saved money can be utilized to expand your business. Let’s accept this – it’s not possible to get desired kind of candidates locally all the times. Many times your company suffers only because you can’t find manpower of your choice. Hiring virtual employees from our company will help you solve this problem. As you work with our company you will have access to a large global talent pool that can provide you all types of skill sets that can meet your requirements. India is known for its technical manpower. You can find all kind of skill sets in this growing market. As the world is becoming a village it has become far easier to find any kind of skill sets from any part of the world. Compared to hiring a full time employee locally it is far better to outsource your manpower requirement to overseas companies based in India. You have far more flexibility in hiring a full time staff in India than hiring locally. For example, you can simply hire anyone and let go of him any time you desire. This will come handy in all kinds of business uncertainties. You can also hire a remote worker working for you half day and at any time slot of your choice. If you hire WordPress developer from Optimal Virtual Employee then you will realize that he is good in communication in English. You can talk to them on a regular basis. They will send you daily report of work done by them. They will be available on phone, email, chat and Skype for communicating any time you want. This will make your life easier. You can feel comfortable due to regular communication with your team. If you work with our virtual staff then there is guarantee of safety and security of data of your company. We give utmost importance to security of your data. Your company owns all sources codes. We have NDA (Non-Disclosure Agreement) for security of your intellectual property. You can be sure of confidentiality of your data, which will not be shared with any third party.